The national flower of Japan, the cherry blossom – or Sakura, represents a time of renewal and optimism. The pops of pink mark the ending of winter and signify the beginning of spring. Due to their quick blooming season, cherry blossoms also symbolize the transience of life, a major theme in Buddhism. Cherry blossoms’ magnificent but brief lifespan, falling a couple of weeks after full bloom, reminds people that similar to the delicate white-pink flowers a human’s life is also short and beautiful. Additionally, fallen cherry blossom petals represent the souls of Japanese samurais with a noble character, who were known not to fear death, and who were killed while sacrificing their lives for the emperor. There are many more significant meanings of the cherry blossom, and the Japanese reflect on them every year during a custom called hanami. 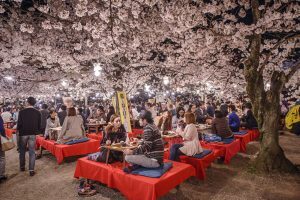 The word hanami means “flower viewing.” During a celebration that’s more than a thousand years old, people gather to eat, drink, and celebrate with a picnic-style party underneath the cherry blossoms. The word sakura is still widely associated with musical lyrics, poems, literature, clothing, and restaurants. If you’re looking for an authentic Japanese dining experience in Orlando, join us at Shōgun Sakura Sushi located in the Rosen Inn on International Drive. Just like the cherry blossom’s beauty awakens many senses, Sakura’s selection of the finest Orlando sushi will excite you. To reserve your table, please call 407-352-1607 or book a table online through our website.